More parenting humor from the author of I Heart My Little A-Holes (2013). 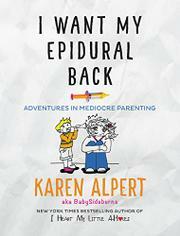 "I'm mediocre," writes Alpert in one of the first entries in her scattered new book on raising children. "Now you might be like, uhhh, why would you admit that? But let me tell you something: I am damn proud of being mediocre because I'm really awesome at it. And that’s no easy task." Unfortunately, most of the intended comic moments fall flat. (How many times can we read a version of this Chelsea Handler–esque joke? “You would take your coffee intravenously if it were an option. And your vodka.” The narrative reads as blatant, you'd-better-laugh-or-else comedy that lacks wit, grace, or narrative finesse. Then again, the book should appeal to readers who are amused by the fact that Alpert calls her children "douchenuggets" or "crotchmuffins," or that her husband "jackhammered" her while they tried to conceive their second child. The author drops a surplus of “WTF” throughout her chronicles of taking her child to school, volunteering to be a Girl Scout mom, traveling on an airplane, or discovering her two children pooped on the toilet at the same time. But if that doesn't sound funny, readers would be better off hanging out with a bunch of kids whose humor is less vulgar and easily as stupid and gross. Not all is lost for Alpert, though; she does show signs of true compassion when she talks about her feelings in regard to the Newtown mass shooting, and she makes some valid points in her letter to all grandparents. If the author dialed back the forcefulness of her endeavors and left out more of her kids' bodily functions, she might realize that she doesn’t need to work so hard to get a good belly laugh out of parents. Crass, rarely entertaining comedy that pokes fun at motherhood.